Road runners love the Twin Tunnels portion of the Historic Columbia River Highway just east of Hood River. From gate to gate, the 4.5-mile section is closed to traffic, making a nice out-and-back. Golden maples arch over the trail offering a bit of shelter from an unexpected spattering of rain. Look for the 100-year-old stone mile markers along the way, and inside the tunnel at milepost 72, keep an eye out for graffiti from 1921 when travelers were snowed in here. A viewpoint at the peak of the route offers a gorgeous vista of the Columbia River. Push on past the east gate and you can run on Highway 30 into the little town of Mosier and beyond (open to traffic here, but usually slower and courteous). Save the date: Race this route as part of the Columbia Gorge Half Marathon and Marathon (October 22, 2017) or the Twin Tunnels Turkey Trot 8K (November). 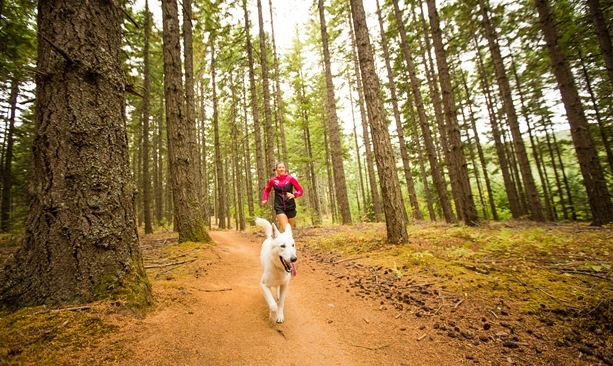 The Post Canyon trail system on the west side of Hood River is a popular mountain biking area but also beloved by trail runners. Numerous routes climb and descend under swaying fir trees. Parking at the Seven Streams Trailhead, runners can follow Trail 100 up to the Family Man stunt area (popular with families with small kids) and around to Trail 102 (also called The Kleeway) to form an easy-to-follow, 3-ish mile loop. If you’d like to explore with someone who knows their way around, meet up with a casual running group organized by Shortt Supply at 8 a.m. on Saturdays, which usually runs between 4 and 6 miles. 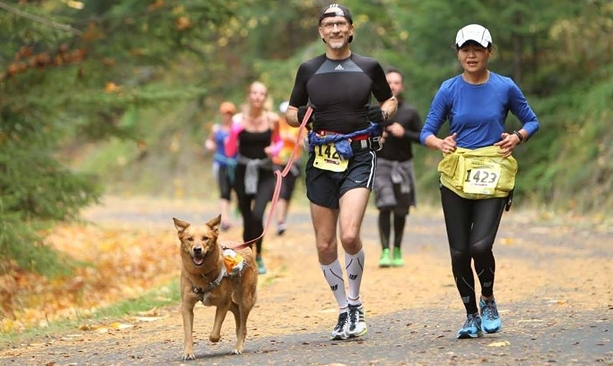 Gorge Trail 400 is another great bet for trail trotters. The section leaving from Wyeth Campground and heading west takes you into a mossy forest with big trees, huge ferns and beautiful views of the river. A five-way intersection of several other trails around mile 4 makes a great spot to turn around. In The Dalles, check out the 6-mile paved trail along the Columbia River between the Columbia Gorge Discovery Center and the Riverfront Park. This fast, flat route is a great place to spot migrating birds on the river. Eileen Garvin lives and writes in Hood River. When she’s not hunched over her keyboard or digging in the garden, you can find her mountain biking, kiteboarding, hiking, skiing or camping somewhere in Oregon.